Last week a sketching class assignment was to sketch an area in your house. Somewhere that had a lot going on, or a complex scene. I looked around a bit and decided on my teen daughter’s room. What could be more complex and detailed than that? Though I think her room is “messy” (as most teens’ rooms are), she claims that it’s just fine because she can find everything and knows exactly where things are. If it gets picked up and organized, she says she can’t find anything. So, I bravely sat on the floor and looked for a focal point to tell my story. She plays electric guitar and is becoming quite good. 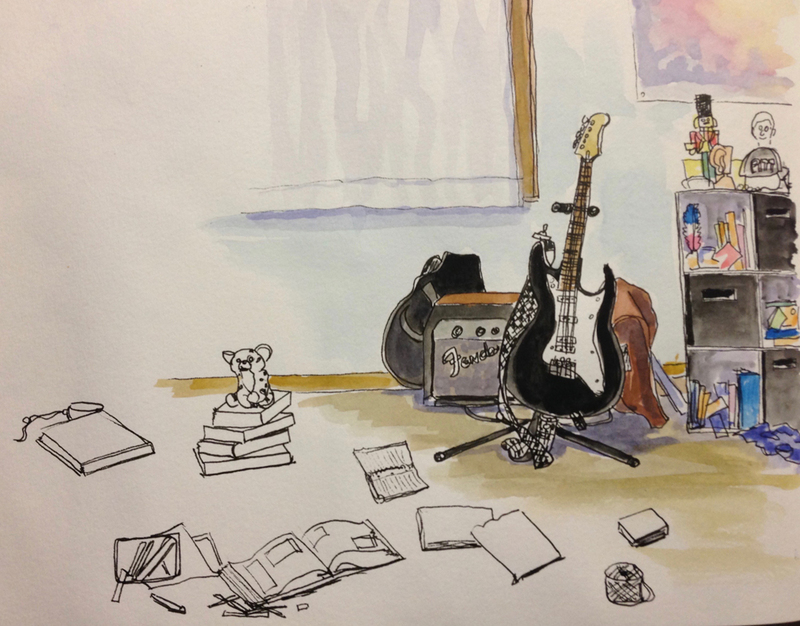 So I decided to sketch the guitar, then expand the focus and include other things, like a shelf, music equipment, and books and pencils on the floor, even a lone ball of string. The page felt a little blank, so I added a trace of her window and curtain. I used my watercolors to add color, keeping a few things that weren’t the focus devoid of color. Sometimes we don’t have to look far to find things that are colorful, complex, or interesting. Sometimes our living spaces can provide just that! Where might you develop a sketch of an area in your house?